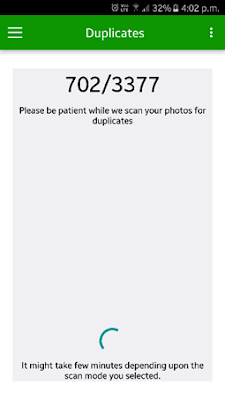 Duplicate photo files contribute the highest part of total duplicate files on your device. These identical files generate when you take multiple same shots, share files using different apps, download same photos multiple times, take data backup etc. These files occupy a lot of storage space affecting your file search time and device performance. You can remove all such files manually which takes considerable time and efforts. Else you can use duplicate photo remover apps for instant and accurate results. You can use this tool for improved device performance as it works on advanced techniques to provide you quick and reliable results. It offers various useful features. Let’s discuss some of them here. Using this app, you can select scan mode from multiple scan options. 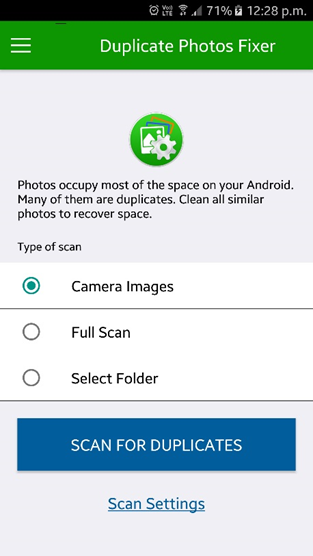 You can select from camera images, full scan mode or specific folder to scan and find duplicate photo files. This is useful feature to refine your search for better results. Additionally, it offers “Scan Settings” option at home page of the app. It allows you to set matching level to find similar and exact looking files. Matching level varies from low to high, where low level depicts similar files and high-level display exact looking files. Scan process delivers quick and accurate results. It uses smart techniques and advanced algorithms to find and delete duplicate files even from the remotest corners of your device. The process is designed to reduce manual efforts and time. 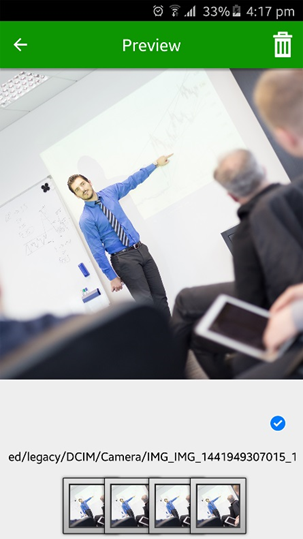 App display results in intuitive and user-friendly manner. Here, results are displayed in groups in auto-mark format. 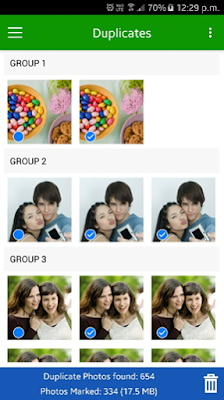 App keeps all last files of the group marked to be deleted. Alternatively, you can choose “Unmark All” option to manually select the files for deletion. Once you have marked and selected the files, click on delete button to instantly recover some valuable storage space. Using this feature, you can clear existing cache of the app. 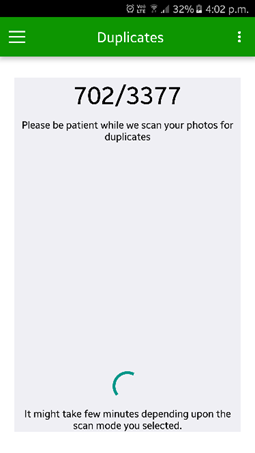 Thus, app will initiate a fresh scan next time. This feature is available in results under menu (three vertical dots in upper right corner). Under this feature, you can see preview of the selected file before you delete them. It is helpful to manage your photo gallery in much better way. 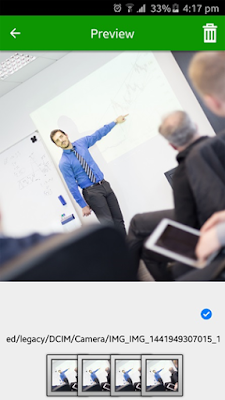 Under, preview, it displays information like file size, image resolution, and path of the file. Here, you can find all identical files from the specific group. App offers multiple language options to help users around the world. It supports all major language options to help huge user base. You can select language of your choice and app will transliterate all features in the selected language. 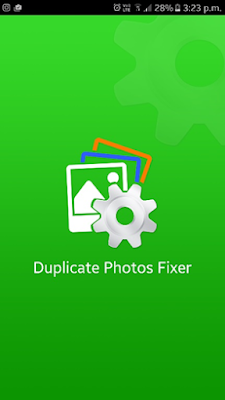 Duplicate PhotosFixer is a state-of-the-art app which is tailor-made to fit everyone’s needs. 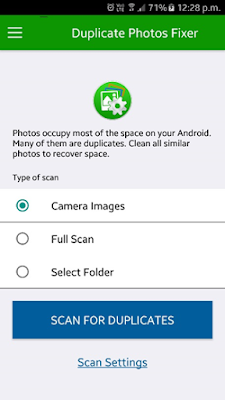 It works on smart algorithms to find and clean all unnecessary duplicate photo files even from the remotest corners of your device. It helps you recover valuable storage space and improve device performance by reducing file search time. We highly recommend this app for every user.